I’m not a self-hater. Yet, after reading another deeply fulfilling romance novel, I find myself coming down from the thrill of my latest vein tap with that same old feeling that I’m betraying my own feminist belief system. I mean, really, romance novels?? I'm a hard-core feminist. How can I possibly be so satisfied reading about these testosterone-oozing alpha-males? They embody the antithesis of a world of equality for the sexes. But, I have to admit it. I love, love, LOVE to read about a strong female character falling for an uber alpha-male who pursues her at all cost, despite her best defenses against over-bearing he-man types looking for their next big conquest. In the end, her walls come crumbling down around her in molten passion and when her defenses lie in rubble, before her very eyes, he transforms out of that inferno like a phoenix into her faithful, devoted and respectful lover and family man. That an alpha-male can becomes that all-around good-guy that protects and cares for his family, whilst still retaining his unbridled primal physical desire for HIS one-and-only woman is, granted, totally fantasy land stuff. But, yes, oh, yes, this is the stuff good romance novels are made of! As a feminist, my favorite romance novels are written by authors that construct female protagonists that are strong, intelligent, assertive, independent and shrewd. These aren't the milquetoast chicks your mom read between Harlequin covers. These women don't need, nor want, a man to rescue, conquer, and/or seduce them. In the romance books I love, these tough chicks are forced to interact with he-man bad-boys that typically don’t stand a chance of making it past “GO” with these women. Yet somehow the author weaves a tale where her best defenses come falling down around her, she breaks, opening herself to him, letting him take her, willingly, even as every bone in her body screams that this is a bad idea. She can’t help herself. She matches his passion in ways that he doesn’t expect. She surprises him... and herself. If written well, the next few pages come as close to spontaneous combustion as the printed word can get. As a feminist, it becomes paramount that all of this is constructed by the author in a way that this woman can be completely vulnerable to this alpha-male in a believable manner without her being weak, stupid, dependent, naïve, or even entirely submissive. Not all romance writers do this, but the ones that I admire do, as does the one I aspire to become. So both of them come away from the mind-altering connection they share somehow changed. But then there's a conflict. Something happens to confirm to her that he’s every bit as bad as she originally thought, maybe worse. She kicks herself for letting him in. She gets out the stone and mortar, hastily rebuilding her rampart. She may be broken-hearted but she's not rolling over. She knew the risks of falling for him, and there's no one to blame but herself. When she thinks it is over, then our hero is somehow redeemed. She finds out something about him that redeems him in her eyes. This is another key point in a romance novel, which was pointed out to me quite eloquently by Tracy Wolff, a favorite author of mine, in a presentation I attended some time ago. The author of a bad boy romance novel has to push the envelope, trying to make this guy as bad as bad can be yet still managing somehow to remain redeemable in the eyes of the heroine (and the reader). It's the knife-edge romance writers tight-rope walk: bad but not too bad. If we readers feel the line's been crossed, and the male not worthy of our female, then the story is corrupted, turning into something twisted and perverse. The author can't betray the readers. It's understood by all romance readers that the heroine is to realize a reward worthy of her, something of value, something good, even if it is all wrapped up in an oh-so-bad-boy package complete with a Chippendale’s bough. As a feminist, it's really difficult to find plausible scenarios where male characters can be this bad and still redeemable in a way that doesn't offend our feminist sensibilities. It's not like I'm going to forgive the guy simply because he's "a man". That's the excuse that had me abandoning romance novels altogether as a teenager viewing them as "unhealthy." But with paranormal romance novels, I find that the feminist in me can relax a little bit. Why? Because most men in paranormal romance novels have one thing in common that's unique compared to other romance alpha-male heroes. These men are vampires, werewolves, shape-shifters, or other such preternatural creatures. They have a ready-made excuse for acting like ... well, animals. And , paradoxically, they have a perfect built-in excuse for redemption. We can chose to believe that these paranormal alpha-male dudes want to treat their women as equals, but they have this inner compulsion to act as monsters act. When the heroine triggers the guy's primal side (bringing out his beast), he takes what he wants, driven by animalistic desire. He simply cannot help himself when he dominates and conquers in the heat of the moment. It’s in his nature, one he often intrinsically struggles with and yet is helpless to change or control. So he’s bad, very bad, but he's also oh so good! Socially she is his equal, but when it comes to his beast she doesn't stand a chance. He delivers both the hot and raw alpha-male and the loving family-man in a perfectly redeemable 1-2 sucker punch as described in my previous blog entry. So he is bad but redeemable without a feminist having to sell out. What more could a feminist want? It’s brilliant! 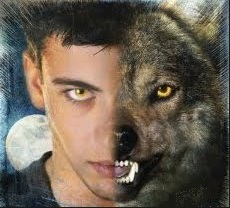 Thinking about this at a deeper level, the duality of these paranormal males (the man at odds with his inner beast) is much like the feminist who loves reading romance (the female demanding equality and her conflicting fantasies of being taken by an alpha-male in the bedroom). Duality seems to be something we feminist romance junkies can relate to. Perhaps this is one of the reasons paranormal romance is so popular? A feminist can read paranormal romance and not feel like they've completely sold out to the old Harlequin mentality. Of course, I still wouldn't dare read these in public except on my Kindle or iPad. No one can see the cover of my trashy romance novel as I sit at Whole Foods and read on my Kindle over my lunch break. I know, right?! I mean I too love Stephanie Meyer too, but Bella is a bit milquetoast for my inner-feminist...granted she is a teenager. But BDB is amazing! Tough women and even tougher brothers. Yum! After you've read all 10 books, try JRW's Fallen Angel series set in the same town, another great paranormal series.. There are 2 FA books and a 3rd to be released in Sept 2011. JRW also writes contemporary romance under pen name Jessica Bird also full of alpha-male bad boys and strong independent women. She is one of my favorite paranormal writers. Another is Amanda Hocking but again her females are younger. Also a local Austin writer, Tessa Adams, has a paranormal romance Dragon's Heat series that is very similar in structure to BDB and also with educated feminist heroines. I attended one of her lectures where I learned about the redemption factor I talk about here. I think paranormal romance lends itself to appealing bad boys that can effectively transform into that other side of the 1-2 sucker punch of alpha-male bad boy turned devoted family man without feeling like they've been neutered. I haven't read Leslie's work yet but she came up as a recommended read after my Anita Blake series (Laurell K Hamilton) addiction. It was announced last month that she was late stage adrenal cancer. My thoughts and prayers go out to her and her loved ones. I think what appeals to me most with the romane genre, young adult or otherwise, is that I am guaranteed a happy end, closing the book feeling hope, love, fulfillment and that dreams can come true. Fantasyland? Yep. But wouldn't we all like to loose control just once and have it all turn out better than our wildest dreams? Wow, I never dreamed that my blog rantings might end up fodder for an English paper! I'm so glad you found my perspective on the subject interesting. And thank you too for letting me know here! !